After about a couple of months of running I took my trainers back to the shop. Not for an exchange, I just needed some advice. I was suffering random blisters and I felt as though at times the shoes weren’t tight enough allowing my foot to move around creating these little nightmares and at other times the shoes were too tight and I was developing a pain on the top of the foot. The end result was always compromising the run and having to let the feet heal before getting out again. Damn, I wanted an instant fix. I’d been using running socks since I did the Great North Run first time round, had no problems so bought the same socks again when I started running again at the start of this challenge, fancy things with patches of different colours running across them to give the impression of “support” and ripples in the weave to grip or ventilate. Specific left and right ones and a price tag of about £15, for £15 To be honest I expected them to dictate which foot they’d be most effective on. 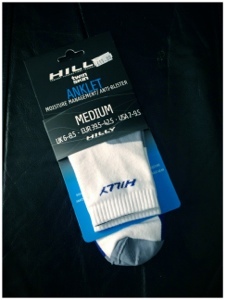 They now make very good cycling socks! I also tried some much cheaper ones from the sports store Decathlon. no specific problems below the 5 mile mark with these I’m just a snob. So when the running shop guy asked me if I’d tried twin skin socks I looked at them on the stand and presumed them to be a bit too “normal” to be all those catchwords to my feet (supportive, breathable and grippy). But then he told me there was a money back guarantee against blisters. Ran 2 miles, developed blisters, tied and loosened shoes, rubbed as I ran some more, stopped running and turned back, decided to try running without socks, put socks back on and walked, got home and got changed, small blister on right instep. Went to running shop and had the above conversation, bought socks then went home. Waited till Jill got home from work and the kids were in bed, ran 13.7 miles. Got in very late but very happy! In twin skins, with a blister. It didn’t get any worse either! The technology behind having two layers of sock which only rub against each other is not new. Back in my backpacking days wearing sock “liners” was commonplace. so to make the two layers into a single sock and thin enough to take up a single sock width in a running shoe is just perfect. In fact although I don’t want to review running socks (using my baby like soft feet as a testing aid won’t give the best results) I do want to throw these into the mix for anyone considering their first running socks. In fact, check this offer out at Go Outdoors (if the offer’s finished it was £4.97 a pair!) Worth their weight in……. 40% Meryl skinlifE, 30% Nylon, 28% Cotton and 2% Lycra! Previous Post Tshirts have arrived! Next Post You just can’t escape cycling these days…… The NHS website covers cycling.